Between late May 2016 and July 2017, we ran a Kickstarter campaigntransforming us from being just an idea to a start-up company. Now Endamanufactures running shoes in Kenya and distributes them around the world. We did it with the help of Kickstarter backers, volunteers, friends, and family. Our first shoes: the Enda Iten. You can order them on our website. We cannot say “thank you” enough to all the people who chipped in in one form or another to make Enda a reality. As the recipients of such overwhelming generosity, we want to make sure we’re paying it forward as much as we can. We have learned many lessons along the way, some tougher than others! We hope this post will provide insight into the process of running a successful campaign and then creating a new product. Traffic: How many people you can get to your page (from emails, social media, earned media coverage and adverts)? Conversion: What % of those people will contribute to your campaign? This will be different depending on the source of traffic: friends receiving emails have a higher conversion rate than people coming from a news article. Value: How much can you get each person to contribute? Depending on what you’re doing with your crowdfunding campaign, how you approach each of these variables will be different. But here’s some are some of the tactics we used to maximise each of these variables. Our most important initial traffic was a long time in the making. As we built the company, we not only created relevant in-bound content, but also solicited and received feedback from a lot of people. 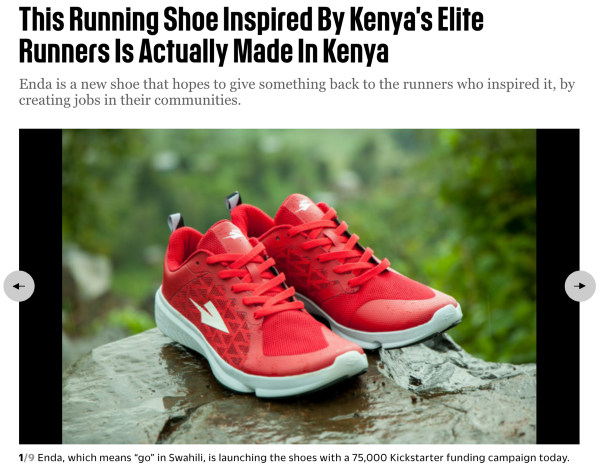 We produced blog posts about Kenyan running, surveyed people about our logo as well as what name we should give to our debut shoe model, and surveyed runners about what they would want in a running shoe. All of this helped build an audience on social media and, more importantly, on email. We then started asking people to sign up to support our Kickstarter campaign the moment it launched. We offered a small “early-bird” discount, so people who signed up would have a chance to snag a better price. Our second chunk of traffic came from leveraging our existing audience to reach more people. We constantly messaged backers about sharing the campaign with their friends and created a referral rewards programme for backers who brought in their friends. The referral rewards programme served as a thank you to the people who were willing to make an extra effort to find more backers for our campaign. Our third big slice of traffic came from media. Before the campaign even started, we approached several journalists offering them different exclusive angles of how they could tell the story of the campaign. The story you tell, and how you tell it, is critical in helping you know which specific media outlets to target. 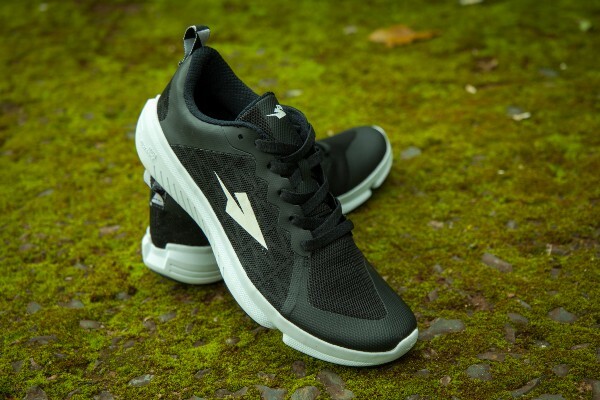 Naturally, we targeted mainstream media but also deliberately targeted running blogs and gear websites, which gave us audience with runners and who would want to try out our shoes and thereby support our Kickstarter campaign. The best advice we can give about getting media is to remember: journalists are humans with jobs to do. Don’t send them press releases like they are some publication robots. Their goal is to inform and entertain their audiences, so communicate with them with an empathetic understanding of the challenges they face in doing their job and help them as quickly and easily see how your story will be interesting to their audience. Finally, we’d be negligent if we didn’t mention platform traffic. Kickstarter as a platform certainly referred a fair number of backers to us through their own editorial and algorithmic recommendations. We weren’t counting on this, but it was a nice boost and a good reason to chose Kickstarter for your campaign. It did also help that based on our product, story and generated interest, we were recognized as both Kickstarter ‘Projects We Love’ as well as ‘Project of the Day’. The latter gave us a chance to be on Kickstarter’s homepage for a day. Having a quality video also makes a great difference in connecting to customers. Projects with videos generally do better than those without, but the quality of video is also very important. We’d estimate 50% of our effort going into the campaign was in creating a great video. The video from our Kickstarter campaign. Once you have a great video, the next thing is to listen to your audiences and make adjustments to address the barriers you’re hearing that might be stopping people from buying. For example: in our case, people were asking about sizing, so we added content to help people find the right sizing. Overall, the Kickstarter page needs to have as much information as possible. Part of the reason people back a Kickstarter project is to be part of creating something new. So as we edited and revised page content we just kept on adding in more and more. The advice Kickstarter gives is that most people give around $20 so offering a great reward at the $20 level drives more contributions. We’re sure Kickstarter have great data to back up this advice, but we thought about it differently: we wanted to nudge people to increase their contribution. So we offered a nice reward (an Enda Bracelet) for a small contribution, but then a t-shirt and a bracelet for about the cost of two bracelets. Of course the main show of our whole campaign were our shoes, so we focused on getting people to order a pair. Or two. We gave discounts on multiple pairs, and added in a “money can’t buy” reward of specially numbered shoes, which were our first shoes of the production run. By creating a collector’s item like this, we gave people a chance to buy into something special and also a good reason to increase their contribution. Maximising those three variables was the core of our strategy, and as we went along, we made our tactical decisions by asking ourselves what were the best ways to increase traffic, conversion rate, or contribution size. 1. Did you hire PR specialists for your campaign? No. We didn’t hire any outside PR help. Professional PR certainly has it’s place, but for a relatively small campaign, it’s perfectly possible for the creators of the campaign to manage a number of media contacts. When you launch a Kickstarter campaign, a lot of PR and marketing firms will get in touch offering services. At some point, it did feel a bit as though they were like vultures trying to prey on desperate entrepreneurs who were stressed about hitting their goal. If you’re going to use a PR or marketing firm, make sure to figure out who you want to work with in advance, and ignore the multitude of solicitations you get mid-campaign. 2. Did you advertise on paid social media? If yes, which platform(s) and also, which platform worked best for you? And what was your budget? Yes. We did try out some paid advertising on social media. We found our ads brought in new followers on Instagram, did practically nothing on Twitter, and netted some sales on Facebook. We didn’t spend much money on the campaigns, but if we had a larger budget, we’d have invested it on Facebook so as to drill down into the audiences that were successfully converting to sales. Honestly though, considering the time it takes doing this, you might find it is better to focus more on producing new and better content to engage your base and have them spread the message to their friends. Kickstarter campaigns are exciting, so word of mouth tactics can be especially powerful during this brief window of time. 3. How did you keep momentum? Campaigns are bound to slow down in the middle. The spike at the start of ours was largely due to the fact that we told our email list exactly when we would launch the campaign and also let them know we would offer discounted shoes for the first people to contribute. This helped drive a strong initial surge. The surge actually helped keep momentum since it helped create buzz on social media, showed the press we were a credible campaign worth covering, and likely played a role in being selected as the Kickstarter ‘Project of the Day’ on the day we hit our funding goal. Beyond that: we organized a running event one week after launching the campaign, and created a referral rewards programme, which drove about 10% of our total contributions. The main thing to remember: momentum will slow down mid-campaign. Stay focused and keep working to churn out content and drive people to your campaign. Don’t get desperate. You need to remember your backers are with you because they want you to succeed, and desperation makes potential backers doubt you will. 4. What would you change about the way you handled your campaign, given the chance? Some pictures from our event, one week into the campaign. First, we would wait longer to run the campaign. We felt a great deal of urgency to get started and we thought (perhaps rightly) that running the campaign ahead of the Olympics would get us a bit more media. We could have waited longer, built up our supporter list, and lined up more media for the launch of the campaign. Second, we would do more live events. We had one small running event, which generated a great deal of media and social media posts about the campaign. If we had done 2–3 more events in different locations, we could have generated more enthusiasm and garnered more media coverage. The hardest part of our campaign came after the campaign was over. We went to two of our key suppliers, and found they weren’t with us anymore. One offered to sell us their equipment so we could start our own factory, and the other decided we were too small and risky a client to take on. So we had to rebuild our supply chain, creating a big delay in our timelines for delivering to customers. We were able to find new suppliers, and create a product we’re proud of. While there were many lessons along the way about shoe materials, supplier agreements, and much more, there are a couple of general lessons we learned during this time that are broadly applicable no matter what you’re building. Kickstarter is all about creating something new, and people want to be part of the creation process. This means you need to keep backers up to speed throughout the process. There were times when we definitely failed to do this. When something wasn’t quite right, there was an urge to fix it before we let people know. However, being quiet and leaving people in the dark is a worse type of uncertainty than letting people know there is a problem and you’re working on it. We had to fight our instincts on many occasions and put out a Kickstarter update before we had all the questions answered. Generally when we did this, people were much happier with us than when they didn’t know what was going on. If we were to do this process again, we’d likely force ourselves to do updates at least every few weeks to keep people up to speed. In the end, the most important thing is to have your audience with you on the journey. Having experts is important. None of what we’ve done would have been possible without input, advice, and support of experts in campaigning, design, shoe-making, logistics, PR, and many other fields. We’ve long since lost count on the number of people who given us invaluable guidance. The challenge for us, being new to the footwear industry, was we sometimes didn’t know when this advice wasn’t right. There are certainly times when we got advice that, in hindsight, we should have known wasn’t the best. So trust your instincts and question everything. When you’re doing something new and innovative, sometimes you’ll have to challenge convention. As we rebuilt the supply chain, we kept deliberating target dates with the whole team — when new samples could be ready, when shipments would arrive, how long it would take to clear customs, etc. We’d add up the dates and communicated to our backers when we thought we’d be able to start shipping shoes. But we found even the smallest error on estimates had a cascading effect; a small bump in the road would lead to significant delays in progress and throw off every subsequent estimate. When delivering a new physical product, our experience would be it takes about twice as long as initial estimates would tell you. We navigated the post-campaign challenges and create shoes we love, but the logistics of getting them to customers proved the hardest mountain to climb. We got the shoes out, but learned the hard way you have to know exactly how you are shipping products before you launch your campaign so you can communicate that information to backers during the campaign. Kickstarter is like building a logistics system backward. Normally you’d expect a few sales to start, then grow gradually while increasing your logistics capacity. When you have Kickstarter orders, suddenly you’re going from zero to thousands. This makes logistics super challenging. The way we dealt with shipping was to use a local logistics service in Kenya for hand deliveries in Nairobi and then a couple of other local courier services around the country. For the US, we were able to import our shoes, then use our own fulfilment center to post the shoes. In Australia and New Zealand, we got an agreement in place with a distributor who fulfilled the Kickstarter orders and will continue to serve customers in that region on an ongoing basis. We had fewer customers in Europe and other countries and had to send individual parcels via DHL. Shipments to Europe and other countries were very expensive, and the customer experience wasn’t great, since in many countries it meant there was duty payable on arrival. We wish we could have avoided this, if we’d worked with a service like Blackbox from the very beginning, perhaps we could have. Beyond not being able to create the best backer experience for everyone, we also encountered costs that were higher than we’d planned. This was because the cost of sending a package is usually the higher of volume or weight. Getting shoe boxes for each specific shoe size would be very expensive since suppliers require a minimum order quantity for each size. We therefore settled on a standard volume for each box, regardless of the size of the shoe meaning for smaller shoe sizes, especially women’s, we paid more than we could have for shipping simply because of the size of the box rather than the actual weight of the box and its components. In hindsight, we should have worked with both our design team and our courier services to design a box with a reduced volume, or perhaps even just shipping the largest men’s sizes in a different type of package. Here’s a quick summary of some of the key lessons. Again, our deepest and most humble thanks to everyone who has made Enda possible. The volunteers who help us make the campaign, the many great people who helped us make our first shoes, friends and family who supported us in innumerable ways, and of course our backers who brought Enda to life. Asante sana. Thank you all.